The folks at Premiere Author Publishing sent me a copy of Professor Wormbog in the Search for the Zipperump-a-zoo for the Great Holiday Give. I'd never heard of them before, but they seem to facilitate a sort of self-publishing platform for established authors. Though the format isn't as aesthetically awesome as the original oversized-edition with the matte pages, still, it's back in print which is a zillion times better than having it languish in over-priced eBay obscurity. Plus, the idea of authors having a bit more control over reprinting out-of-print books intrigues me. I can't tell if these are publicist run yet, but it seems they've gotten Mercer Mayer to sign up for Twitter and Facebook, which is super in its own right. To be entered to win this amazing reprint, simply comment on this post by 11:59 PM Sunday, December 4. A winner will be selected at random and announced (along with all the other winners from the week) on Monday, December 5. This book was sent to me by the publisher to giveaway, but I don't think I need to tell you that this in no way educated my opinion of the publisher or the title in question. I've been bragging on this book since the beginning of time! I thought you were giving away one book per week, not per day. My chances just increased - yay!! Oh my gosh, I love these illustrations! Too cute. ooooooohhhh!!! It's wonderful!!! i'd like to try!! Sweet! More Mercer Mayer in the world is always a good thing. looks completely charming and luscious! please throw my name into the hat. I am super excited to see all of these re-prints! We'd be thrilled to win a copy of this book. Thanks for the chance. 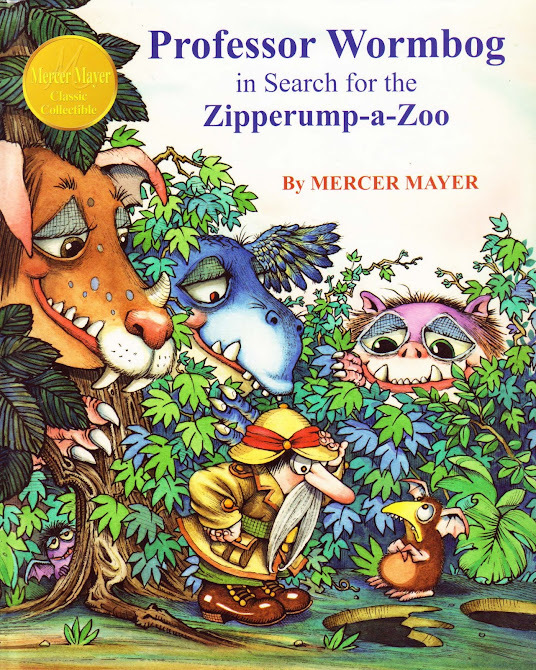 We love Mercer Mayer, particularly the Stamp Collecting Trollusk, and would welcome a Zipperump-a-zoo too! These illustrations never get old. I loved this book as a child. I have been bugging my parents to locate my old copy. It would be great to win this for my children so I can show them how fabulous it is!!! So glad that you have included this one by Mayer! Great illustrations. Might be fun for a future art project! Love the doozy of a title for this Mercer Mayer gem. My 5-year-old would get a kick out of it too. look at those gorgeous illustrations! Love Mercer Mayer's style! It always take me back to when I was 8. Great stuff! Thanks for the shot at this. It looks great! Lovely! Mercer Mayer is a personal favorite of mine. Thanks for the opportunity! Loved Prof Wormbog growing up and would love to share this with my daughter! My boy Joey would love this book—please enter me to win! My granddaughter would love to get this book. Thanks for the chance! My wife and I were just talking about Mercer Meyers. Fond memories. Love Mercer Mayer. Have never seen this one. I loved Mercer Mayer books as a kid, and it's so much fun to see my kids enjoy them too. Another winner. Very excited about your giveaway! I just wrapped 24 X-Mas books up for my daughters for our holiday advent calendar. I got many wonderful vintage books at our local used book store! Didn't see this one though. Any book with monsters in it works for me. We read this once at our local borders and my daughter was hooked onto it. Would love a personal copy though! Love Mercer Mayer's work. Now I've got to collect 'em all! I really would like to know the story behind that cover! Oh I loved Mercer Mayer when I was little... loved finding the hidden spider and cricket (I think it was?) on each page.